On the 25th day of June 1941, President Franklin D. Roosevelt issued Executive Order No. 8802 establishing the fair employment practice that began to erase discrimination in the Armed Forces. A board headed by Brigadier General Keller E. Rocher was organized to study the integration of African-Americans being assigned to the Composite Defense Battalion, which Samuel included coastal artillery, anti aircraft, infantry and tanks. In 1942, President Roosevelt established a presidential directive giving African Americans an opportunity to be recruited into the Marine Corps. These African Americans, from all states, were not sent to the traditional boot camps of Parris Island, South Carolina and San Diego, California. Instead, African-American Marines were segregated, experiencing basic training at Montford Point, a facility at Camp Lejeune, North Carolina. Four courageous gentlemen from Savannah, Georgia were among that group: Samuel Berksteiner, Reginald Brown, Willie Outler and John A. White. The initial intent of the Marine Corps hierarchy was to discharge these African American Marines after the War, returning them to civilian life and leaving the Marine Corps an all-white organization. Attitudes changed and reality took hold as the war progressed. Once given the chance to prove themselves, it became impossible to deny the fact that this new breed of Marine was just as capable as all other Marines – regardless of race, color, creed or National origin. In July of 1948 President Harry S. Truman issued Executive Order #9981 negating segregation. In September of 1949, Montford Marine Camp was deactivated – ending seven years of segregation. On April 19, 1974, Montford Point Camp was renamed Camp Johnson, in honor of the late Sergeant Major, Gilbert H. “Hashmark” Johnson. He was one of the first African Americans to join the Marine Corps, a Distinguished Montford Point Drill Instructor and a Veteran of WWII and the Korean War. Camp Johnson remains the only Marine Corps installation named in honor of an African-American. The Montford Point Marine Association, Inc. (MPMA) is a non-profit 501c3 organization established to perpetuate the legacy of the first 20,000 African American Marines who entered the U. S. Marine Corps from 1942 to 1949. Membership in the Association is open to veterans and active members of all branches of the Armed Forces, regardless of race, creed or national origin. The Association carries out educational assistance programs for our youth and numerous veteran and community outreach initiatives. 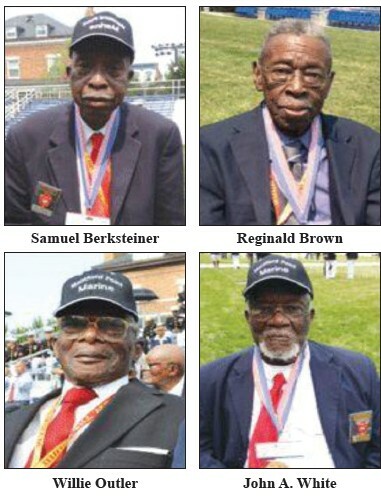 In June 2012, President Obama awarded the Montford Point Marines the Congressional Gold Medal in Washington, DC. Samuel Berksteiner, Reginald Brown, Willie Outler and John White received the prestigious award. In March 2013, the U. S. Navy christened the first Mobile Landing Platform in the fleet, in their honor: USNS Montford Point (MLP-1). In October 2013, they were honored at the 11th Annual Spirit of Excellence Business Awards Gala, produced and directed by Estelle Mannion, CEO of Stellar Productions, LLC and Emceed by Dawn Baker of WTOC-11 News. They received the Lieutenant Stacy L. Henderson Spirit of Excellence Military Leadership Award. Savannah native Dr. Henderson, a retired naval officer and current reigning National Queen of the Montford Point Marine Association, Inc. travelled from Great Lakes, IL to personally make the award presentation. U. S. Marine Corps Veterans Elijah Abram of the MPMA Beaufort, SC Chapter and Eugene Campbell of the MPMA Chicago Chapter also attended the Gala and paid homage to these extraordinary gentlemen. Not only during Black History Month but every day the Montford Point Marines are honored and remembered for their many selfless sacrifices which changed the course of history in the U. S. Marine Corps, as well as the U. S. Armed Forces. To learn more about The Montford Point Marines of Savannah: Samuel Berksteiner, Reginald Brown, Rev. Willie Outler and John A. White visit: www.montfordpointmarines.org.